Home Creatine cretine supplements good nutrition how to take optimal training positive mental attitude right equipment side effects why take What is Creatine? Why take? How to take? Side Effects? What is Creatine? Why take? How to take? Side Effects? Creatine is a compound formed from several amino acids that is stored in high amounts in our muscles. The source of creatine to replace our daily turnover (~ 2 g) is shared roughly equally between dietary intake (animal muscle foods such as meat, poultry and eggs) and manufacture by our bodies. 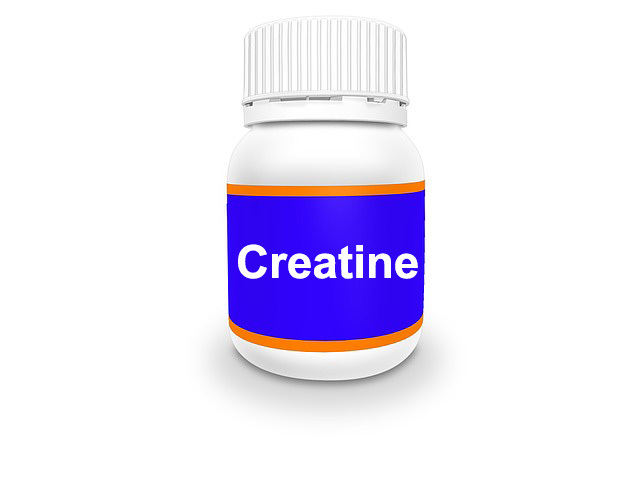 Creatine is produced in the kidneys then transported to the muscle for uptake. Muscle creatine levels appear to be lower in vegetarians, indicating that the body's production of creatine may not be sufficient to replace the lack of a dietary source. Creatine is found in the muscle in the form of free creatine and creatine phosphate with the amounts varying from person to person. Creatine phosphate performs a number of important roles in exercise metabolism, the best known being to provide a limited, but rapidly accessed, power system to regenerate ATP, the fuel currency of the muscle. This 'phosphagen' power system is the most important fuel source for the performance of all-out sprints of 5-10 second duration. But creatine phosphate may also provide other roles in the generation of power via the anaerobic use of carbohydrate, and aerobic metabolism inside the muscle cell. It is not surprising that an increase in the muscle creatine phosphate level sounds attractive to an athlete. Initial public interest in creatine began in 1992, inspired by stories that several British track and field athletes, including Linford Christie, owed their amazing success at the Barcelona Olympics to creatine supplementation. New supplements supported by testimonials from elite athletes are common in sport. However, such testimonials are more marketing hype than proof that a supplement is valuable. What made the creatine story different was the almost simultaneous publication of research on creatine supplementation in a peer-reviewed scientific journal. A study by well-respected physiologists showed that the intake of large doses of creatine over a number of days could increase muscle levels of creatine and creatine phosphate, especially in trained subjects. Since then, hundreds of studies and reviews have been published, with the consensus being that creatine supplementation can increase muscle creatine content and improve exercise capacity and performance. In addition to its use in sports nutrition, creatine supplementation has a therapeutic role, being able to assist in the gain of muscle mass and strength in elderly and other sarcopenic (muscle depleted) populations. Furthermore, it is valuable in the treatment of a number of diseases such as gyrate atrophy of the eye, muscular dystrophy, and other degenerative neuromuscular disorders. It may also have a role in brain function since a secondary location of creatine storage is in the brain. How to take creatine supplements ? • The quickest way to "creatine load" is to take large doses (20-30 g per day) for around 5-7 days. Typically, these doses are split over the day to sustain plasma creatine levels (e.g. 5g, four to five times each day). Eating a large amount of carbohydrate (about 70-100 g) with each dose increases creatine uptake via the stimulatory effects of insulin. Therefore it is useful to take your creatine doses along with a meal or substantial carbohydrate-rich snack. • Some supplement manufacturers recommend a total daily dose of 3-5 g/day. This will eventually load the muscle, but may take up to 28 days before the muscle is saturated with creatine. • The muscle cell has a creatine threshold or saturation point. Typically, creatine loading increases total creatine and creatine phosphate by 25% above resting levels. The response is individual and some athletes may improve their stores by 50%. Some research has suggested that athletes whose levels are initially lowest might respond best to supplementation. Obviously only those who can achieve a substantial increase in muscle creatine levels will show improved function. • If supplementation is ceased, muscle creatine stores gradually return to resting levels - some studies have shown that it takes 4-6 weeks for this to occur. A 'maintenance' supplemental dose of 2-5 g creatine per day keeps the loaded muscle at elevated levels. • Many athletes cycle their creatine supplementation - loading up, maintaining for a certain training period, and then stopping the supplements for a couple of weeks before reloading. This may suit the athlete's training cycle or periodisation. Whether such cyclical use is better than prolonged continual use has not been studied. Which athletes benefit from creatine supplementation? • Creatine loading is associated with an immediate weight gain of ~1kg, probably due to the retention of fluid stored with the creatine inside the cell. Many athletes who continue to gain weight over the next months, often greater than 5 kg, claim this to be mainly muscle gain. If this is the case, it is likely to be due to the athlete training harder and more effectively when loaded, particularly in the gym. Direct stimulation of muscle protein synthesis in response to creatine supplementation or increased cellular volume is still being investigated. • Some studies show that the elevated creatine stores improve the performance of the initial bout or a single high-intensity exercise sprint. However, the benefits are very small and hard to detect in most study protocols. • There is consistent evidence that creatine supplementation improves the recovery between repeated bouts of high-intensity exercise. Enhanced muscle creatine levels increase the rate of resynthesis of phosphocreatine during the rest periods between sprints, so the muscle has greater stores for the next bout. This is most important when the recovery period is brief, from 30 seconds to less than 3 minutes. • Several studies have reported that creatine loading enhances the performance of high-intensity performance lasting 5-8 minutes. The mechanism for this effect is not clear. • Most creatine studies have been undertaken in laboratory settings with recreational or moderately trained subjects. More studies are needed to confirm performance benefits in elite athletes and in real-life settings. The exercise most likely to benefit from extra creatine is repeated bouts of high-intensity work with short rest periods (e.g. weight training, resistance training, and team and racquet sports). Future work should target these specific situations to show whether creatine supplementation has measurable benefits on competitive performance. After all, it is not certain whether any increase in sprint ability will translate into a measurable improvement in the game outcome - for example, goals scored or skilful shots played. • Creatine does not appear to enhance the performance of aerobic or endurance sports. In fact, one study of cross-country runners showed performance impairment following creatine supplementation, which was attributed to the weight gain. • There is some evidence that a creatine-loaded muscle is more responsive to carbohydrate loading. The benefits of these observations require further study. Also Read : Painfull Joints? Give Glucosamine. Some agencies have issued warnings regarding creatine supplementation. For example, in 2001, a French food authority declared that creatine supplementation could increase the risk of developing cancer. However, other health educators have disputed these claims and blamed them on a faulty interpretation of animal studies. To date there is little evidence that creatine supplementation poses problems in healthy people. A few cases of kidney complications have been reported in medical journals but, typically, the athletes involved had pre-existing problems. However, it should be pointed out that there are no long-term studies involving the large doses often reported by athletes. The lack of such studies, and the abundance of information showing the efficacy of supplementation protocols in this fact sheet, provides strong evidence against indiscriminate use of creatine. There are theories and anecdotal reports of muscle cramps and tears, and impaired hydration status in athletes taking creatine supplements. However, the studies and reviews of these issues have failed to find an association between creatine use and an increased risk of these problems. However, it is possible that some individuals may respond unfavourably to creatine use. Before taking creatine, the athlete needs to consider whether their sporting activities are likely to truly benefit from an elevation in muscle content. This should be balanced by the “costs”, such as the expense of the supplements, the risk of taking a contaminated supplement and the effect of a small weight gain. In some sports, such as those involving weight divisions, the gain of even 1 kg can be a problem. It remains sensible for creatine users to stick to the minimum effective dose for creatine loading and maintenance, to seek supervision and monitoring of their creatine use, and use a reputable brand of creatine. Special populations such as children, adolescents and pregnant woman are reminded that the safety of creatine use has not been properly established. These are considered the foundation of good performance. It is hoped that young athletes or beginners in a sport will be prepared to 'pay their dues' to these factors to allow them to reach new levels of performance, rather than looking for short cuts in a bottle. Meanwhile, for well-trained and elite athletes, creatine can enhance the gains of heavy training. Also Read : How to gain weight and muscles?